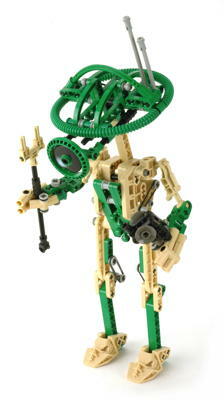 The Pit Droid was among the very first line of Star Wars Technic models. The Pit Droid appears in Episode One in Watto's junkyard and is apparently used to help repair equipment. Just like the droid in the movie, this model can be collapsed for storage and then pops open when the nose button is pushed. The mechanism is driven by a series of rubber bands (knees, torso, fingers, and nose). The stability of the model when standing depends entirely on the rubber bands which degrade over time and eventually result in the model falling over. Fortunately, extra rubber bands were supplied with the model. As can be seen in the revolving animation, this model leans forward significantly when standing. This is not just an accident of balance; there are parts which protrude from the heels of the feet forcing this posture. 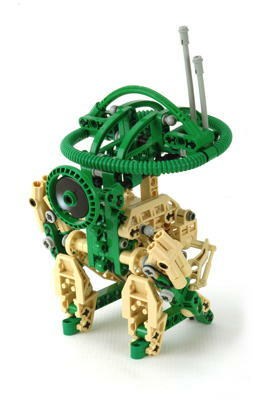 The model construction relies heavily on parts from the recent Slizer and Roborider themes. The feet are made from Slizer heads, the arms from Slizer ball joints, and the legs and torso from Slizer and Roborider parts. The nose is actually a Roborider disc with a custom printed pattern. 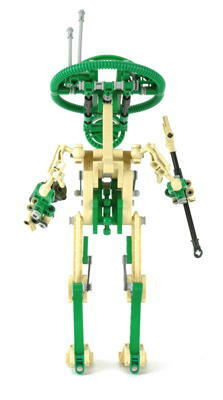 The remainder of the parts are studless Technic parts but in the unusual colors of tan and green. 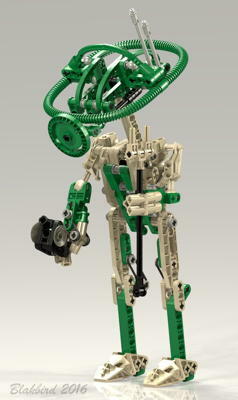 Green was rare at this point in Technic history, but tan had never appeared at all. 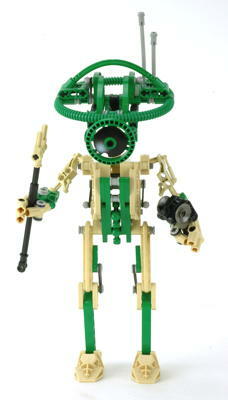 LEGO® Star Wars was its first appearance. The model includes instructions for an alternate model of a speeder bike. Just like the pit droid in the movie, the model collapses into a small size for storage. The knees fold forward and the legs fold back. The legs and neck are geared together so that they fold at the same time. The nose locks into the top of the torso. The arms simply fold manually at using ball joints. When the nose is pushed, the lock is released and the model pops open using rubber bands. The model is designed such that the rubber bands are all shortest when the model is standing, therefore this is the stable configuration towards which the rubber bands drive the model when unlocked.